Iran and six world powers known as the P5+1 (China, France, Germany, Russia, the United Kingdom, and the United States) reached a historic nuclear deal on July 14, 2015 that limited Iran's nuclear program and enhanced monitoring in exchange for relief from nuclear sanctions. Prior to that, Iran had been engaged in efforts to acquire the capability to build nuclear weapons for more than two decades. Although it remained uncertain whether Tehran would have made the final decision to build nuclear weapons, it had developed a range of technologies, including uranium enrichment, warhead design, and delivery systems, that would give it this option in a relatively short time frame. Tehran maintains that its nuclear activities are entirely peaceful. What follows is a chronological recount of the most significant developments in Iran’s nuclear program, international efforts to negotiate a settlement to address this controversial issue, and implementation of the agreement reached by Iran and the P5+1 on July 14, 2015. November 1967: Iran’s first nuclear reactor, the U.S. supplied five-megawatt Tehran Research Reactor (TRR) goes critical. It operates on uranium enriched to about 93 percent (it is converted to run on 20 percent in 1993,) which the United States also supplies. Americans are anxious about the growing risk of a nuclear war. Adopting a policy of “no first use” would reduce the chances of war from a miscalculation or misunderstanding. A nuclear war can never be won, and must never be fought. February 1970: The Iranian parliament ratifies the nuclear Nonproliferation Treaty (NPT). 1974: Shah Reza Pahlavi establishes the Atomic Energy Organization of Iran (AEOI) and announces plans to generate about 23,000 megawatts of energy over 20 years, including the construction of 23 nuclear power plants and the development of a full nuclear fuel cycle. 1979: The Iranian Revolution and the seizure of the U.S. embassy in Tehran result in a severing of U.S.-Iranian ties and damages Iran’s relationship with the West. Iranian nuclear projects are halted. January 19, 1984: The U.S. Department of State adds Iran to its list of state sponsors of terrorism, effectively imposing sweeping sanctions on Tehran. 1987: Iran acquires technical schematics for building a P-1 centrifuge from the Abdul Qadeer Khan network. 1992: Congress passes the Iran-Iraq Arms Nonproliferation Act of 1992, which prohibits the transfer of controlled goods or technology that might contribute “knowingly and materially” to Iran’s proliferation of advanced conventional weapons. 1993: Conversion of the TRR is completed by Argentina’s Applied Research Institute. It now runs on fuel enriched to just less than 20 percent, 115 kilograms of which is provided by Argentina; the contract for the conversion was signed in 1987. August 5, 1996: The U.S. Congress passes the Iran-Libya Sanctions Act, also known as the Iran Sanctions Act, that penalizes foreign and U.S. investment exceeding $20 million in Iran’s energy sector in one year. August 2002: The National Council of Resistance on Iran, the political wing of the terrorist organization Mujahideen-e Khalq (MeK), holds a press conference and declares Iran has built nuclear facilities near Natanz and Arak. September 12, 2003: The International Atomic Energy Agency (IAEA) Board of Governors adopts a resolution calling for Iran to suspend all enrichment – and reprocessing- related activities. The resolution requires Iran to declare all material relevant to its uranium-enrichment program and allow IAEA inspectors to conduct environmental sampling at any location. The resolution requires Iran to meet its conditions by October 31st 2003. October 21, 2003: Iran agrees to meet IAEA demands by the October 31st deadline. In a deal struck between Iran and European foreign ministers, Iran agrees to suspend its uranium–enrichment activities and ratify an additional protocol requiring Iran to provide an expanded declaration of its nuclear activities and granting the IAEA broader rights of access to sites in the country. June 18, 2004: The IAEA rebukes Iran for failing to cooperate with IAEA inspectors. Iran responds by refusing to suspend enrichment-related activities as it had previously pledged. November 14, 2004: Iran notifies the IAEA that it will suspend enrichment-related activities following talks with France, Germany, and the United Kingdom. According to the so-called Paris Agreement, Iran would maintain the suspension for the duration of talks among the four countries. As a result, the IAEA Board of Governors decides not to refer Tehran to the UN Security Council. February 27, 2005: Russia and Iran conclude a nuclear fuel supply agreement in which Russia would provide fuel for the Bushehr reactor it is constructing and Iran would return the spent nuclear fuel to Russia. The arrangement is aimed at preventing Iran from extracting plutonium for nuclear weapons from the spent nuclear fuel. August 8, 2005: Iran begins producing uranium hexafluoride at its Isfahan facility. As a result, France, Germany, and the United Kingdom halt negotiations with Tehran. September 24, 2005: The IAEA adopts a resolution finding Iran in noncompliance with its safeguards agreement by a vote of 22-1 with 12 members abstaining. The resolution says that the nature of Iran’s nuclear activities and the lack of assurance in their peaceful nature fall under the purview of the UN Security Council, paving the way for a future referral. February 4, 2006: A special meeting of the IAEA Board of Governors refers Iran to the UN Security Council. The resolution “deems it necessary for Iran to” suspend its enrichment-related activities, reconsider the construction of the Arak heavy-water reactor, ratify the additional protocol to its safeguards agreement, and fully cooperate with the agency’s investigation. February 6, 2006: Iran tells the IAEA that it will stop voluntarily implementing the additional protocol and other non-legally binding inspection procedures. April 11, 2006: Iran announces that it has enriched uranium for the first time. The uranium enriched to about 3.5 percent was produced at the Natanz pilot enrichment plant. June 6, 2006: China, France, Germany, Russia the United Kingdom, and the United Sates (the P5+1, referring to the five permanent members of the UN Security Council and Germany) propose a framework agreement to Iran offering incentives for Iran to halt its enrichment program for an indefinite period of time. July 31, 2006: The UN Security Council adopts Resolution 1696, making the IAEA’s calls for Iran to suspend enrichment –related and reprocessing activities legally binding for the first time. December 23, 2006: The UN Security Council unanimously adopts Resolution 1737, imposing sanctions on Iran for its failure to suspend its enrichment-related activities. The sanctions prohibit countries from transferring sensitive nuclear- and missile-related technology to Iran and require that all countries freeze the assets of ten Iranian organizations and twelve individuals for their involvement in Iran’s nuclear and missile programs. March 24, 2007: The UN Security Council unanimously adopts Resolution 1747 in response to Iran’s continued failure to comply with the council’s demand to suspend Uranium enrichment. August 21, 2007: Following three rounds of talks in July and August, the IAEA and Iran agree on a “work plan” for Iran to answer long-standing questions about its nuclear activities, including work suspected of being related to nuclear weapons development. December 3, 2007: The United States publicly releases an unclassified summary of a new National Intelligence Estimate report on Iran’s nuclear program. The NIE says that the intelligence community judged “with high confidence” that Iran halted its nuclear weapons program in the fall of 2003 and assessed with moderate confidence that the program had not resumed as of mid-2007. The report defines Iran’s nuclear weapons program as “design and weaponization work” as well as clandestine uranium conversion and enrichment. The NIE also said that Iran was believed to be technically capable of producing enough highly enriched uranium for a nuclear weapon between 2010 and 2015. March 3, 2008: The UN Security Council passes Resolution 1803, further broadening sanctions on Iran. It requires increased efforts on the part of member states to prevent Iran from acquiring sensitive nuclear or missile technology and adds 13 persons and seven entities to the UN blacklist. June 14, 2008: The P5+1 present a new comprehensive proposal to Iran updating its 2006 incentives package. The new proposal maintained the same basic framework as the one in 2006, but highlighted an initial “freeze-for-freeze” process wherein Iran would halt any expansion of its enrichment activities while the UN Security Council agreed not to impose additional sanctions. February 3, 2009: Iran announces that it successfully carried out its first satellite launch, raising international concerns that Iran’s ballistic missile potential was growing. April 8, 2009: Following an Iran policy review by the new Obama administration, the United States announces that it would participate fully in the P5+1 talks with Iran, a departure from the previous administration’s policy requiring Iran to meet UN demands first. June 12, 2009: Iran holds presidential elections. Incumbent Mahmoud Ahmadinejad is declared the winner amid many indications that the election was rigged. This sparks weeks of protests within Iran and delays diplomatic efforts to address Iran’s nuclear program. September 25, 2009: United States President Barack Obama, British Prime Minister Gordon Brown, and French President Nicolas Sarkozy announced that Iran has been constructing a secret, second uranium-enrichment facility, Fordow, in the mountains near the holy city of Qom. IAEA spokesman Marc Vidricaire said that Iran informed the agency September 21 about the existence of the facility, but U.S. intelligence officials said Iran offered the confirmation only after learning that it had been discovered by the United States. February 9, 2010: Iran begins the process of producing 20 percent enriched uranium, allegedly for the TRR. May 17, 2010: Brazil, Iran, and Turkey issue a joint declaration attempting to resuscitate the TRR fuel-swap proposal. In the declaration, Iran agrees to ship 1,200 kilograms of 3.5 percent enriched uranium to Turkey in return for TRR fuel from France and Russia. France, Russia, and the United States reject the arrangement, citing Iran’s larger stockpile of 3.5 percent-enriched uranium and the failure of the declaration to address Iran’s enrichment to 20 percent. June 9, 2010: The UN Security Council adopts Resolution 1929, significantly expanding sanctions against Iran. In addition to tightening proliferation-related sanctions and banning Iran from carrying out nuclear-capable ballistic missile tests, the resolution imposes an arms embargo on the transfer of major weapons systems to Iran. June 24, 2010: Congress adopts the Comprehensive Iran Sanctions, Accountability, and Divestment Act; tightening U.S. sanctions against firms investing in Iran’s energy sector, extending those sanctions until 2016, and imposing new sanctions on companies that sell refined petroleum to Iran. July 26, 2010: The EU agrees to further sanctions against Iran. A statement issued by EU member state foreign ministers refers to the new sanctions as “a comprehensive and robust package of measures in the areas of trade, financial services, energy, [and] transport, as well as additional designations for [a] visa ban and asset freeze. September 16, 2010: The Stuxnet computer virus is first identified by a security expert as a directed attack against an Iranian nuclear-related facility, likely to be the Natanz enrichment plant. January 21-22, 2011: Following a December meeting in Geneva, the P5+1 meets with Iran in Istanbul, but the two sides do not arrive at any substantive agreement. Iran’s two preconditions for further discussions on a fuel-swap plan and transparency measures, recognition of a right to enrichment and the lifting of sanctions, were rejected by the P5+1. February 16, 2011: U.S. intelligence officials tell a Senate committee that Iran has not yet decided whether it wants to develop nuclear weapons but is keeping that option open through development of its material capabilities. May 8, 2011: Iran’s Bushehr nuclear power plant begins operations and successfully achieves a sustained chain reaction two days later, according to Atomstroyexport, the Russian state-owned company constructing and operating the plant. June 8, 2011: Iran announces that it intends to triple the rate of 20 percent-enriched uranium production using more-advanced centrifuge designs. It also says it will move production to the Fordow enrichment plant near Qom, which is still under construction. July 12, 2011: Russian foreign minister Sergey Lavrov unveils a proposal wherein Iran would take steps to increase cooperation with the IAEA and carry out confidence-building measures in return for a gradual easing of sanctions. October 21, 2011: EU foreign policy chief, Catherine Ashton, sends a letter to Iranian nuclear negotiator Saeed Jalili calling for “meaningful discussions on concrete confidence-building steps” to address international concerns about Iran’s nuclear ambitions. November 8, 2011: The IAEA releases a report detailing a range of activities related to nuclear weapons development in which Iran is suspected to have engaged as part of a structured program prior to 2004. The report raises concerns that some weapons-related activities occurred after 2003. The information in the report is based primarily on information received from other countries, but also includes information from the agency’s own investigation. The findings appear consistent with the U.S. 2007 National Intelligence Estimate on Iran. December 31, 2011: As part of the fiscal year 2012 National Defense Authorization Act, Congress passes legislation that will allow the United States to sanction foreign banks if they continue to process transactions with the Central Bank of Iran. January 2012: The EU passes a decision that will ban all member countries from importing Iranian oil beginning July 1, 2012. Other provisions of the decision will prevent member countries from providing the necessary protection and indemnity insurance for tankers carrying Iranian oil. January 29-31, 2012: Following an exchange of letters between Iran and the IAEA, it was agreed that an Agency team would travel to Tehran to begin discussions on the IAEA’s investigations into the possible military dimensions of Iran’s nuclear program laid out in the November 2011 IAEA report. February 15, 2012: Jalili responds to Ashton’s Oct. 21 letter, while Iran simultaneously announces a number of nuclear advances, including the domestic production of a fuel plate for the TRR. April 14, 2012: Iran meets with the P5+1 in Istanbul for talks both sides call “positive.” They agree on a framework of continuing negotiations with a step-by-step process and reciprocal actions. May 23-24, 2012: Iran and the P5+1 meet in Baghdad for a second set of talks. June 18-19, 2012: Talks between Iran and the P5+1 continue in Moscow. Representatives discuss the substance of a P5+1 proposal and an Iranian proposal. Ashton and Jalili announce that will determine if political-level talks will continue after a technical-level meeting in July. July 3, 2012: Experts representing the six parties meet in Istanbul to discuss the technical aspects of the P5+1 proposal and the Iranian proposal. July 24, 2012: Schmid and Bagheri meet in Istanbul to discuss the outcome of the technical level experts meeting and confirm that Ashton and Jalili will talk to determine the future of the negotiations. August 30, 2012: The IAEA reports that Iran increased the number of centrifuges installed at the Fordow enrichment plant and is continuing to produce uranium enriched to 20 percent in excess of its needs for the Tehran Research Reactor. September 2012: Ashton and Jalili meet in Istanbul to assess “common points” reached at the low-level expert talks held in early July. The meeting was not considered a formal negotiation. September 27, 2012: In a speech to the UN General Assembly, Israeli Prime Minister Benjamin Netanyahu draws a red-line for an Israeli attack on Iran. Netanyahu defines his red-line as Iran amassing enough uranium enriched to 20 percent (approximately 250 kilograms), which, when further enriched, will be enough for one bomb. November 16, 2012: The IAEA reports that since August, Iran completed installation of the approximately 2,800 centrifuges that Fordow is designed to hold, although the number enriching remains constant. The number of cascades producing 20 percent enriched uranium remains constant at Fordow. The report also notes that Iran installed more centrifuges at Natanz, and continued producing uranium enriched to 20 percent. February 26, 2013: Iran and the P5+1 resume negotiations in Almaty, Kazakhstan over Iran's nuclear program. The P5+1 offers Iran an updated proposal based largely on the 2012 package. April 5-6, 2013: Iran and the P5+1 meet again in Almaty for a second round of talks. At the end of the meetings, negotiators announce that no further meetings are scheduled and the sides remain far apart. June 3, 2013: At the quarterly meeting of the IAEA Board of Governors, Director General Yukiya Amano says that the agency's talks with Iran over clarifying the possible military dimensions of Iran's nuclear program have not made any progress. June 14, 2013: Hassan Rouhani is elected president of Iran. A former nuclear negotiator, he asserts that Iran will maintain its nuclear program, but offers to be more transparent. August 6, 2013: Three days after his inauguration, Iran's President Hasan Rouhani calls for the resumption of serious negotiations with the P5+1 on Iran's nuclear program. September 26, 2013: The P5+1 foreign ministers meet with Iranian Foreign Minister Javad Zarif on the sidelines on the UN General Assembly meeting in New York. Zarif presents the P5+1 with a new proposal that U.S. Secretary of State John Kerry describes as “very different in the vision” of possibilities for the future. Zarif and Kerry meeting for a bilateral exchange after the larger group meeting. Zarif later says he and Kerry move to agree “first, on the parameters of the end game.” Zarif says Iran and the P5+1 will think about the order of steps that need to be implemented to “address the immediate concerns of [the] two sides” and move toward finalizing a deal within a year. The parties agree to meet again on October 15 in Geneva. September 27, 2013: President Barack Obama calls Iranian President Hassan Rouhani, marking the highest level contact between the U.S. and Iran since 1979. While President Obama says that there will be significant obstacles to overcome, he believes a comprehensive resolution can be reached. In Vienna, Iran's new envoy to the IAEA, Reza Najafi, meets with IAEA deputy director Herman Nackaerts to resume negotiations on the structured approach to resolving the agency's concerns about the possible military dimensions of Iran's nuclear program. Both sides describe the meeting as constructive and agree to meet again on October 28. October 15-16, 2013: Iran and the P5+1 meet in Geneva to resume negotiations over Iran's nuclear program. At the end of the talks, the parties release a joint statement describing the meetings as "substantive and forward looking." The statement also says that Iran presented a new proposal that the P5+1 carefully considered as an "important contribution" to the talks. The proposal is understood to contain a broad framework for a comprehensive agreement and an interim confidence building measure to be instituted over the next 3-6 months, but no details are given as the parties agreed to keep the negotiations confidential. Wendy Sherman, Undersecretary of State for Political Affairs, says after the talks that Iran approached the meetings "with a candor" she had not heard in her two years of negotiating with Tehran. The parties agree to meet again November 7-8 in Geneva with an experts level meeting October 30-31. October 28-29, 2013: Iran meets with the IAEA to continue discussions over the agency's investigations into Iran's past nuclear activities with possible military dimensions. According to a joint statement, Iran presented a new proposal at the talks that contained "practical measures" to "strengthen cooperation and dialogue with a view to future resolution of all outstanding issues." Iran and the IAEA agree to meet again in Tehran on November 11. November 7-10, 2013: The P5+1 and Iran meet in Geneva to continue negotiations over Iran's nuclear program. On November 8, with the expectation that a deal is close, U.S. Secretary of State John Kerry flies to Geneva to join the talks, as do the foreign ministers from the other P5+1 countries. The parties fail to reach an agreement on a first-phase deal, but announce that talks will continue on November 20 in Geneva. Secretary Kerry says in Nov. 10 press conference that the parties "narrowed the differences" and made significant progress toward reaching an agreement during the talks. November 11, 2013: IAEA Director General Yukiya Amano and Ali Akbar Salehi meet in Tehran to continue talks on an approach for the agency's investigations into Iran's past nuclear activities with possible military dimensions. Amano and Salehi sign a Framework for Cooperation Agreement. The framework lays out initial practical steps to be take by Iran within three months, including allowing IAEA access to the Heavy Water Production Plant at Arak and the Gchine uranium mine, and providing the agency with information on new research reactors and nuclear power plants that Iran intends to build. The statement commits the parties to cooperation "aimed at ensuring the exclusively peaceful nature of Iran’s nuclear programme through the resolution of all outstanding issues that have not already been resolved by the IAEA." November 20-24, 2013: Iran and the P5+1 meet again in Geneva to continue negotiations. On November 23, the foreign ministers from the P5+1 join the negotiations. Early on November 24, Iranian Minister Javad Zarif and Catherine Ashton, leader of the P5+1 negotiating team, sign an agreement called the Joint Plan of Action. It lays out specific steps for each side in a six-month, first-phase agreement, and the broad framework to guide negotiations for a comprehensive solution. The first-phase pauses further developments in Iran's nuclear program, rolls back significant elements like the stockpile of 20 percent enriched uranium, and requires more extensive IAEA monitoring and access to nuclear sites. In return, Iran receives limited sanctions relief, repatriation of limited assets frozen abroad, and a commitment that no new nuclear-related sanctions will be imposed on Iran for the duration of the agreement. For more details on the agreement, click here. The plan will establish a Joint Commission to monitor the agreement and work with the IAEA. The six month period can be extended by mutual consent of both parties. December 8, 2013: Under the terms of the Framework for Cooperation Agreement the IAEA visits the Arak Heavy Water Production Plant. December 9-12, 2013: The P5+1 and Iran meet in Geneva at the technical level to begin discussions on the implementation of the Nov. 24 Joint Plant of Action. December 11, 2013: Iran and the IAEA meet again in Vienna to review progress made on the six actions that Iran agreed to take as part of the Framework for Cooperation Agreement. The parties also begin discussing the next practical steps for Iran to take and initially plan to meet again on Jan. 21 to finalize the measures. The meeting is later postponed at the request of Iran to Feb. 8. December 30-31, 2013: Technical level discussions between Iran and the P5+1 on implementing the Joint Plan of Action continue in Geneva. January 9-10, 2014: Iran and the P5+1 meet for a third time in Geneva to discuss implementation. The parties reach an agreement and return to their respective capitals for approval. January 12, 2014: Iran and the P5+1 announce that implementation of the Joint Plan of Action will begin on Jan. 20. January 20, 2014: Implementation of the Joint Plan of Action begins. The IAEA issues a report on Iran's compliance with the deal. The report states that Iran is adhering to the terms of the agreement, including, halting enrichment of uranium to 20 percent, beginning to blend down half of the stockpile of 20 percent enriched uranium to 3.5 percent, and halting work on the Arak Heavy Water Reactor. The IAEA also begins more intrusive and frequent inspections. The United States and the European Union also issue statements saying they have taken the necessary steps to waive the specific sanctions outlined in the Nov. 24 deal and release a schedule of payments for Iran to receive oil money held up in the other countries. February 9, 2014: Iran and the IAEA meet to discuss further actions for Iran to take under the November 11 framework agreement to resolve the agency’s concerns about Iran’s nuclear program. They agree on additional actions, including Iran’s past work on exploding bridgewire detonators, one of the past activities with possible military dimensions. March 17-20, 2014: The P5+1 and Iran meet in Vienna to continue negotiations. April 7-9, 2014: Another round of talks between Iran and the P5+1 take place in Vienna. May 13-16, 2014: The P5+1 and Iran begin drafting the comprehensive agreement. May 21, 2014: Iran and the IAEA announce an additional five actions for Iran to complete before August 25. Two of the activities that Iran agrees to provide information on relate to possible military dimensions. June 2-6, 2014: At the IAEA board meeting Director General Yukiya Amano says that Iran is complying with the terms of the interim agreement and the agency's investigation into the unresolved concerns about Iran's nuclear program. The agency's quarterly report shows that Iran has neutralized nearly all of its stockpile of 20 percent uranium gas by dilution or conversion to powder form. June 16-20, 2014: Iran and the P5+1 hold another round of negotiations in Vienna. July 2-19, 2014: Iran and the P5+1 continue talks in Vienna on a comprehensive nuclear agreement. Early on June 19, the parties announce that they will extend the talks through November 24 and keep the measures agreed to in the interim agreement in place. The parties also announce additional actions that Iran will take, namely converting 25 kg of uranium powder enriched to 20 percent into fuel plates and blending down about 3 tons of uranium enriched to less than 2 percent. The P5+1 will also repatriate $2.8 billion in funds. The parties agree to resume talks in August. August 25, 2014: Iran misses a deadline to complete actions on five areas of concern to the IAEA as part of the agreement that Iran and the agency reached in November 2013. September 5, 2014: The IAEA's quarterly report on Iran's nuclear program shows that Iran is complying with the interim deal, but did not provide the IAEA with information about past activities with possible military dimensions (PMDs) by the Aug. 25 deadline. September 18, 2014: Talks between Iran and the P5+1 resume in New York City on the sidelines of the UN General Assembly. Both sides say that little progress was made at the end of the talks. October 14-16, 2014: Iran and the P5+1 meet in Vienna to continue negotiations. Officials say that they remain focused on reaching an agreement by the Nov. 24 deadline and progress was made during the talks. November 9-10, 2014: Iranian Foreign Minister Zarif and U.S. Secretary of State Kerry meet in Muscat, Oman to continue talks. P5+1 lead negotiator Catherine Ashton is also present. November 18-24, 2014: Iran and the P5+1 meet in Vienna to continue negotiations on an comprehensive agreement. U.S. Secretary of State John Kerry joins the talks on Nov. 20. French Foreign Minister Fabiusu, British Foreign Secretary Hammond, and German Foreign Minister Steinmeier all join the talks between Nov. 20 and 22. Russian Foreign Minister Lavrov arrives on Nov. 23 and Chinese Foreign Minister Wang on Nov. 24. November 24, 2014: Iran and the P5+1 announce that negotiations will be extended because progress was made on the difficult issues and both sides see a path forward. The parties announce that they now aim to reach a political agreement by March and then complete the technical annexes by June 30. Both sides will continue to implement the conditions of the interim Joint Plan of Action from November 2013. Iran and the P5+1 also make additional commitments. December 15, 2014: Talks between the P5+1 and Iran continue in Geneva. U.S. State Department officials say the talks are "good and substantive." Parties plan to meet again in January. December 24, 2014: Iran’s Foreign Minister Mohammad Javad Zarif says in a letter to his foreign counterparts that Iran’s goal remains to reach a comprehensive nuclear deal that assures the world its nuclear program is exclusively peaceful. January 15-18, 2015: The P5+1 and Iran meet in Geneva to continue negotiations. January 21, 2015: In testimony before the Senate Foreign Relations Committee on Jan. 21, U.S. Deputy Secretary of State Antony Blinken says: "We assess that we still have a credible chance of reaching a deal that is in the best interest of America's security, as well as the security of our allies." January 23-24, 2015: Undersecretary of State Wendy Sherman and European Union Political Director Helga Schmid meet again with Iranian Deputy Foreign Minister Abbas Araghchi in Zurich, Switzerland. February 18-20, 2015: Talks between the P5+1 and Iran resume in Vienna. March 17-20, 2015: Talks between the P5+1 and Iran continue in Lausanne. The head of Iran’s Atomic Energy Organization, Ali Akbar Salehi, says to reporters "We have made progress on technical issues… One or two issues remain and need to be discussed." March 25-April 2, 2015: Negotiations continue in Lausanne. By March 29, all of the Foreign Ministers from the seven countries involved and EU foreign policy chief Federica Mogherini are present. April 2, 2015: Iran and the P5+1 announce agreement on a general framework that outlines the broad parameters of a nuclear deal. The United States issues a more specific factsheet on the details. 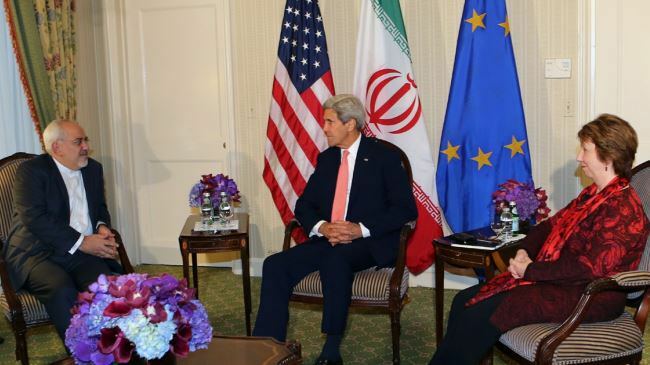 Iran and the P5+1 agree to continue meeting to finalize a deal before June 30. April 14, 2015: The Senate Foreign Relations Committee unanimously passes legislation authored by Senator Bob Corker (R-Tenn.) that will require the President to submit the deal to Congress for a vote of approval or disapproval. According to the legislation, the President will not be able to waive sanctions during the 30 day Congressional review period. April 15, 2015: Iran and the IAEA meet in Tehran to continue discussing the agency's investigations into the possibly military dimensions of Iran's nuclear program. April 27, 2015: U.S. Secretary of State John Kerry and Iranian Foreign Minister Mohammad Javad Zarif meet in New York on the sidelines of the nuclear Nonproliferation Treaty Review Conference. Technical drafting work on the annexes of the agreement is underway. May 7, 2015: The Senate passes the Corker legislation 98-1 on congressional review of an Iran nuclear deal. May 12, 2015: EU and Iranian negotiators meet in Vienna to continue drafting a comprehensive agreement. June 26, 2015: U.S. Secretary of State John Kerry arrives in Vienna to continue negotiations on a nuclear deal with Iran and the P5+1. U.S. Secretary of Energy Ernest Moniz joins Kerry. July 14, 2015: Iran and the P5+1 announce a comprehensive deal. Iran and the IAEA announce a roadmap for the agency's investigation into the possible military dimensions of Iran's nuclear program. July 19, 2015: The Obama administration sends the comprehensive deal and supporting documents to Congress, beginning the 60 day review period mandated by the Iran Nuclear Deal Review Act. July 20, 2015: The UN Security Council unanimously passes a resolution endorsing the nuclear deal and the lifting of UN Security Council nuclear sanctions once key steps are taken in the deal. August 15, 2015: The IAEA confirms that Iran submitted documents and explanations to answer the agency's unresolved concerns about past activities that could be related to nuclear weapons development. September 2, 2015: The 34th Senator announces support for the nuclear deal with Iran, meaning that Congress will not have the support to override a presidential veto on a resolution disapproving of the deal. September 8, 2015: Four additional Senators announce that they will support the nuclear deal with Iran, bringing the total number to 42. This important milestone will prevent the Senate from reaching the 60 vote threshold required for ending debate and moving to vote on a resolution of disapproval. September 9, 2015: The IAEA announces that is submitted follow-up questions to Iran based on the information provided by Iran on Aug. 15. The IAEA is ahead of its Sept. 15 deadline to submit the questions. September 10, 2015: A vote to end debate and move to vote on a resolution of disapproval fails to reach the required 60 votes on the Senate floor. The measure fails 58-42. Four democrats joined the 54 Republicans in favor of moving to vote on the resolution of disaproval. Similar votes fail on Sept. 15 and Sept. 17. September 11, 2015: A vote on a resolution of approval fails in the House of Representatives, 269-162, with 25 Democrats voting joining the Republicans in voting against the measure. September 17, 2015: The congressional review period ends without passage of a resolution of approval or a resolution of disapproval. September 20, 2015: IAEA Director General Yukiya Amano and Deputy Director General Tero Varjoranta visit the Parchin site at Iran. The IAEA has concerns about Iran conducting explosive activities there relevant to a nuclear device. Amano and Varjoranta confirm that environmental sampling was done at the site under IAEA surveillance and the agency is now testing the samples. October 4, 2015: A panel of Iranian lawmakers reviewing the JCPOA release their assessment of the deal. The report issued says that the agreement contains some security threats, such as allowing inspectors access to military sites, but should go ahead. October 10, 2015: Iran tests a medium-range ballistic missile, the Emad. The Emad is a more precise version of the Shahab-3, believed to be capable of carrying a 750 kg payload over 1,700 kilometers. The test is a violation of UN Security Council Resolution 1929 (2010), which prohibits Iran from testing nuclear-capable ballistic missiles. October 10, 2015: Iran's parliament approves a preliminary bill supporting the Iran deal. October 13, 2015: Iran's parliament approves a detailed bill supporting the Iran deal. October 14, 2015: Iran's Guardian Council ratifies the bill approved by the parliament, completing Iran's internal review of the agreement. October 15, 2015: The IAEA announces the activities laid out in the July 14 roadmap for the investigation into the past possible military dimensions of Iran's nuclear program has been completed. The IAEA aims to complete its report by Dec. 15. October 18, 2015: Iran and the P5+1 formally adopt the nuclear deal. Iran begins taking steps to restrict its nuclear program. The United States issues waivers on nuclear-related sanctions to come into effect on implementation day. The EU announces it passed legislation to lift nuclear-related sanctions on implementation day. October 18, 2015: Iran notifies the IAEA of that it will provisionally implement its additional protocol and modified Code 3.1 to its safeguards agreement as of implementation day. October 19, 2015: The first meeting of the Joint Commission takes place in Vienna. One of the purposes of the meeting is to set up working groups called for under the deal, such as the working group on procurement and the Arak reactor modification. October 20, 2015: The Supreme Leader issues a statement endorsing the nuclear deal and bill passed by the Iranian parliament. October 21, 2015: The United States raises Iran's ballistic missile test as a possible violation of UN Security Council Resolution 1929 at a meeting of the Security Council. November 21, 2015: Iran tests another medium-range ballistic missile in violation of UN Security Council Resolution 1929. December 2, 2015: The IAEA issues its assessment of Iran's past activities related to nuclear weapons development (PMDs). The IAEA assess that Tehran had an organized weapons program prior to 2003 and that some activities continued, although not as an organized effort, through 2009. The report says that the agency has no credible indication that nuclear material was diverted from Iran's declared program or that any activities continued after 2009. December 15, 2015: The IAEA Board of Governors holds a special meeting to consider the Dec. 2 report on Iran's weaponization activities. The board passes a resolution terminating past resolutions on Iran's nuclear program and ending the investigation. The board requests that the IAEA continue reporting on Iran's nuclear activities under the nuclear deal and report immediately on any concerns that arise with Iran's implementation. December 28, 2015: Iran announces that it shipped 8.5 tonnes of low-enriched uranium, including the 20 percent enriched material in scrap and waste, out of the country to Russia. In return, Iran receives 140 tonnes of uranium yellowcake. January 11, 2016: Iranian officials announce that the Arak reactor core is being disabled. Iranian and P5+1 officials say that implementation day is close. January 16, 2016: The IAEA verifies that Iran met its nuclear related commitments. Based on the IAEA report, Zarif and Mogherini announce implementation day, triggering the lifting of sanctions. UN Security Council Resolution 2231, which the Council passed in July to endorse the deal and trigger the lifting of UN sanctions comes into effect. Prior resolutions on Iran's nuclear program are terminated. January 17, 2016: The U.S. Treasury Department issues an announcement that new sanctions will be imposed on 11 individuals and entities involved with Iran's ballistic missile programs. U.S. President Barack Obama says that with implementation of the nuclear deal Iran will not obtain nuclear weapons and that "the region, the United States, and the world will be more secure." Iranian President Hassan Rouhani gives a speech saying that "Iran's nuclear rights have been accepted by all." January 26, 2016: Behrouz Kamalvandi, spokesman for the Atomic Energy Organization of Iran, says that Iran and China had signed a basic agreement to formalize China’s assistance in redesigning the Arak reactor during Chinese President Xi Jinping’s visit to Iran the previous week. February 11, 2016: Abbas Qaidaari, director of the Defense and Security Studies Department at the Center for Strategic Studies in the Office of the Iranian President, writes in a piece for the Atlantic Council that “Iran’s strategic defense plan currently sees no justification” for missile ranges greater than 2,000-2,300 kilometers. Qaidaari said that although Tehran is committed to developing its “deterrent conventional defense capabilities,” it will limit its ballistic missiles to that range. February 26, 2016: The IAEA issues its first quarterly report on Iran's post-implementation day nuclear activities. The report notes that Iran is meeting its nuclear obligations, although it slightly exceeded a cap set on the stockpile of heavy water allowed under the agreement. The IAEA notes that Iran had 130.9 metric tons of heavy water, slightly above the 130 metric ton limit set by the deal, but shipped out 20 metric tons on February 24 to stay below the limit. March 9, 2016: Iran test launches two different variations of the Qadr medium-range ballistic missile. March 14, 2016: U.S. Ambassador to the UN Samantha Power says she raised Iran's ballistic missile tests at a Security Council meeting, saying that the tests are inconsistent with UN Security Council Resolution 2231. March 15, 2016: Iranian Foreign Minister Mohammad Javad Zarif defends Iran's missile launches saying that the missiles are permissible under UN Security Council Resolution 2231 because the missiles are not designed to be capable of carrying nuclear warheads. April 22, 2016: Officials from Iran and the United States meet in Vienna, signing a purchase agreement for Washington to buy 32 metric tons of heavy water for $8.6 million. U.S. Secretary of State John Kerry and Iranian Foreign Minister Mohammad Javad Zarif meet in New York to discuss implementation of the deal. In remarks after the meeting Kerry says that Washington is working to clarify confusion amongst foreign banks about the sanctions lifted in January. May 27, 2016: The IAEA issues its quarterly report on Iran's implementation of the nuclear deal. The report shows Iran is abiding by restrictions under the agreement and inspectors have been able to access certain Iranian sites using complimentary access visits. July 18, 2016: Iran's research and development plan for advanced centrifuge machines, leaked to the AP, is reported on in the press. July 29, 2016: In a statement, the IAEA notes it sent a letter to Iran denying it was the source of leaked information about Iranian plans for phasing in advanced centrifuges in 2027. September 8, 2016: The IAEA releases its third quarterly report since JCPOA implementation day, showing Iran continues to abide by its restrictions under the JCPOA. The report notes that Iran removed 96 IR-1 centrifuges from the storage area at Natanz to replace damaged centrifuges that were enriching uranium. September 21, 2016: The U.S. Department of the Treasury Office of Foreign Assets Control grants Airbus and Boeing permission to sell planes to Iran. The licenses were made possible by sanctions waived as part of the JCPOA. September 22, 2016: Iran and the P5+1 meet in New York to review progress on JCPOA implementation and the pace of sanctions relief. The meeting marks the first ministerial-level meeting since the announcement of the deal’s implementation in January. Speaking to the UN General Assembly on the same day, Iranian President Hassan Rouhani expresses concern over the slow pace of sanctions relief and claims the U.S. has been in lack of compliance. September 26, 2016: Sergei Kireienko, head of Rosatom, the state-run Russian nuclear energy company, announces that Moscow purchased 38 tons of heavy-water from Iran. The material was delivered to Russia in mid-September. November 2, 2016: IAEA Director General Yukiya Amano expresses concern to Iranian leaders regarding the size of Iran’s heavy water stock. On November 8th, the Agency confirms that Iran’s heavy water stock, at 130.1 tons, exceeds the 130 metric ton limit outlined in the deal, marking the second time Iran has exceeded the limit. On November 9th, Iran informs the IAEA of plans to remain in compliance by transferring heavy water out of the country. November 8, 2016: Donald Trump is elected as the 45th President of the United States. During the presidential campaign, Trump referred to the JCPOA as the worst deal ever negotiated and pledged to renegotiate it. The U.S.’s European allies in the P5+1 previously signaled they would resist efforts to renegotiate the deal. November 20, 2016: IAEA releases its fourth quarterly report on Iranian nuclear program since JCPOA implementation day. The report notes that Iran had 130.1 metric tons of heavy water, slightly over the 130 metric tons permitted under the deal. The IAEA report says Iran plans to transfer heavy water out of the country. December 1, 2016: Congress passes a 10-year extension of the Iran Sanctions Act (ISA), which becomes law on December 15th. Extension of the ISA is consistent with U.S. obligations under the JCPOA, although many of the ISA’s provisions are being waived under Washington’s commitments under the agreement. December 6, 2016: IAEA verifies that all 11 metric tons of heavy water shipped out of Iran have reached their destination and are in storage, bringing Iran back within the limit on heavy water of 130 metric tons established by the JCPOA. December 13, 2016: President Rouhani announces Iran will respond to Washington’s extension of the Iran Sanctions Act by researching and developing nuclear propulsion for marine vessels. December 15, 2016: U.S. Secretary of State John Kerry reissues sanctions waivers early, on the same day that the ISA renewal comes into effect, to demonstrate the U.S. commitment to the JCPOA. December 18, 2016: IAEA Director General Yukiya Amano visits Iran, meeting with President Rouhani and Ali Akhbar Salehi, head of Iran’s Atomic Energy Organization. Amano and Salehi discussed issues related to implementation. Further, Amano sought clarification on Iran’s announcement regarding naval nuclear reactor research and development. December 23, 2016: The IAEA, at the request of Federica Mogherini, circulates decisions made by the Joint Commission set up to oversee implementation of the nuclear deal. The documents contain additional information on hot cells, recovering waste uranium, describing and calculating efficiency for advanced centrifuges, and utilizing the procurement channel. January 12, 2017: In his confirmation hearing for the position of Secretary of Defense, General Jim Mattis tells Congress that, while he believes the JCPOA is an imperfect agreement, “when America gives her word, we have to live up to it and work with our allies.” His remarks echo a previous statement in April, when he noted there is “no going back” on the deal absent a clear violation of the agreement. Iran receives the first shipment in an order of 100 planes purchased from Airbus. Sanctions waived as part of the nuclear deal allow Iran to purchase new commercial aircraft. February 9, 2017: EU foreign policy chief Federica Mogherini travels to Washington for meetings with Secretary of State Rex Tillerson, former National Security Advisor Michael Flynn, and members of Congress. Mogherini notes that the JCPOA is key for the security of Europe given its geographic proximity to Iran. February 24, 2017: IAEA releases its first quarterly report on Iranian nuclear activity in 2017, reporting on the size of Iran’s stockpile of uranium enriched to 3.67 percent for the first time. The report notes that the stockpile was 101.7 kilograms. The limit established by the deal is 300 kilograms. March 23, 2017: Senator Bob Corker (R-Tenn.) introduces a new Iran sanctions bill, the Countering Iran’s Destabilizing Activities Act of 2017, targeting Iran’s ballistic missile program and support for terrorism. March 31, 2017: Former Deputy Secretary of State Tony Blinken and six former Obama administration officials release an op-ed in Foreign Policy outlining their opposition to the Countering Iran’s Destabilizing Activities Act of 2017. April 18, 2017: Secretary of State Rex Tillerson, in a letter to speaker of the House Paul Ryan, certifies to Congress that Iran is compliant in meeting its obligations under the JCPOA. April 23, 2017: Iran and China resolve a price dispute and complete an agreement to modify Iran’s Arak reactor. China will work with Iran to carry out modifications stipulated by the JCPOA to reduce the reactor’s output of weapons-grade plutonium. May 16, 2017: Ambassador Wendy Sherman, the lead U.S. negotiator for the JCPOA, states her opposition to the Countering Iran’s Destabilizing Activities Act of 2017, noting its potential to undermine the nuclear accord. May 17, 2017: The U.S. renews sanctions waivers as required by its JCPOA obligations, marking the first time the Trump administration has waived sanctions and taken a proactive step to implement the deal. May 19, 2017: Iranian President Hassan Rouhani is re-elected to a second term. EU foreign policy chief Federica Mogherini congratulates Rouhani on Twitter and reaffirms the EU’s commitment to full JCPOA implementation. June 2, 2017: The IAEA releases its second quarterly report in 2017 on Iran’s implementation of the JCPOA, reporting that Iran is meeting its obligations under the nuclear deal. June 15, 2017: Countering Iran’s Destabilizing Activities Act of 2017 (S.722) passes the Senate by a vote of 98-2. The bill was amended to correct sections that violated the JCPOA, but Iran continued to assert that the bill contradicts the spirit of the deal. June 20, 2017: The UN Secretary General releases the biannual report on UN Security Council Resolution 2231, affirming that Iran is complying with the JCPOA but raising concerns about Iran’s ballistic missile activity. July 10, 2017: White House Spokesperson Sarah Huckabee Sanders says that at the G20 summit, President Trump encouraged foreign leaders not to do business with Iran, which Iranian Foreign Minister Javad Zarif later cited as a failure on the part of the United States to “implement its part of the bargain” in an interview. July 17, 2017: The Trump administration reluctantly certifies Iran's compliance with the JCPOA, delaying the announcement for hours and issuing new non-nuclear sanctions on Iran the next day. July 21, 2017: The Joint Commission of the JCPOA meets for the sixth time to address the implementation of the agreement. July 25, 2017: The U.S. House of Representatives passes H.R. 3364, the Countering Adversarial Nations Through Sanctions Act, which would impose new sanctions on Iran, North Korea and Russia. August 31, 2017: In its third quarterly report, the IAEA finds that as of Aug. 21, Iran’s stock of low-enriched uranium was 88.4 kg (194.89 pounds), well below a 202.8-kg limit, and the level of enrichment did not exceed a 3.67 percent cap. Iran’s stock of heavy water, stood at 111 tons, below the 130 ton limit. September 20, 2017: The foreign ministers of China, France, Germany, Iran, Russia, the United Kingdom and the United States meet on the sidelines of the UN General Assembly for the ministerial meeting of the E3/EU+3 and Iran. In remarks following the meeting, EU foreign policy chief Federica Mogherini states that all agreed that all sides are implementing the JCPOA. September 22, 2017: Iran parades its new medium-range ballistic missile tested in January, the Khoramshahr, with a range of about 2,000 km, in a military parade. October 13, 2017: Trump declares that, as part of a broader new strategy toward Iran, he will not certify under the Iran Nuclear Agreement Review Act (INARA) that the suspension of sanctions under the JCPOA is "appropriate and proportionate" to measures taken by Iran under the deal. Trump's decertification itself does not violate the JCPOA. However, decertification opens up a window of 60 days where Congress may re-introduce sanctions waived under the nuclear deal with Iran under an expedited process. In his address, Trump encourages Congress to enact legislation against the JCPOA's "sunset clauses" which set dates after which certain restrictions under the deal on Iran's nuclear program will no longer apply. Trump says if his concerns about the deal are not resolved he will terminate the agreement. Trump also states that he will further sanction the Islamic Revolutionary Guard Corps (IRGC) for its support for terrorism, but does not designate the group as a terrorist organization. Immediately following the announcement, UK Prime Minister Theresa May, German Chancellor Angela Merkel and French President Emmanuel Macron released a joint statement expressing their continued support for the JCPOA. November 13, 2017: The IAEA issues its fourth quarterly report for 2017 on Iran's implementation of the JCPOA. IAEA Director General Yukiya Amano tells the agency's Board of Governors that the nuclear-related commitments are being implemented and that IAEA inspectors have had access to all locations they have needed to visit. December 13, 2017: The JCPOA Joint Commission meets for the seventh time to oversee the implementation of the agreement. December 15, 2017: UN Secretary General Antonio Guterres issues the biannual report on the implementation of Resolution 2231. The report notes that the nuclear deal is being implemented but finds that Iran has violated the arms embargo provisions of Resolution 2231. The report also notes that the secretariat is continuing to investigate allegations that ballistic missiles launched at Saudi Arabia from Yemen were transferred by Iran to the Houthis in violation of 2231. Iran denies the claims. January 12, 2018: The Trump administration announces that it will re-issue waivers on nuclear-related sanctions on Iran to meet U.S. obligations under the agreement. However, Trump says he will not re-issue the waivers again and will withdraw from the deal unless Congress passes legislation addressing what he describes as flaws in the agreement. Trump says his administration is also engaging with European allies on a supplemental agreement of unlimited duration that would impose sanctions if Iran tests long-range missiles, thwarts inspections, or makes progress toward a nuclear weapon. January 26, 2018: The UN panel of experts assessing implementation of sanctions on Yemen finds Iran in noncompliance with its obligations under the arms embargo established by Resolution 2216. The report notes that Iran did not take "necessary measures to prevent the direct or indirect supply, sale, or transfer” of short-range ballistic missiles and other equipment. Iran disputes the report and argues that the evidence is fabricated. February 22, 2018: The IAEA issues its first quarterly report for 2018 on Iran's implementation of the JCPOA. IAEA Director General Yukiya Amano tells the agency's Board of Governors that the nuclear-related commitments are being implemented and that IAEA inspectors have had access to all locations they have needed to visit. As of Feb. 12, 2018, the quantity of Iran’s uranium enriched up to 3.67% U-235 was 109.5 kg. The report notes that Iran informed the agency of its intention to pursue naval nuclear propulsion in the future. March 15, 2018: State Department Director of Policy Planning Brian Hook meets with representatives from the E3 (France, Germany, and the UK) in Berlin to continue discussions on the JCPOA and Trump's demand for a 'supplemental' agreement with the Europeans that addresses sunsets, ballistic missiles, and inspections. March 16, 2018: The JCPOA Joint Commission meets to oversee implementation of the agreement. March 19, 2018: EU foreign policy chief Federica Mogherini says at a meeting of the Foreign Affairs Council that the EU is not considering new sanctions on Iran's ballistic missile activities, amid reports that the E3 are developing such measures. April 11, 2018: Political directors from the E3 (France, Germany, and the UK) and the United States meet in Washington, DC to continue talks on Trump's demand for a supplemental agreement that addresses sunsets, ballistic missiles, and inspections. April 11, 2018: China and Iran hold a seminar on civil nuclear cooperation under the JCPOA in Beijing. April 19, 2018: 500 British, French and German parliamentarians urge U.S. members of Congress to help "keep the JCPOA alive" in a letter. April 24, 2018: U.S. President Trump hosts French President Emmanuel Macron for his first state visit. Macron reports having very frank discussions with Trump about the JCPOA and said that he and President Trump had agreed to work on a "new deal" that keeps the JCPOA, but incorporates additional measures, including on Iranian ballistic missiles. May 8, 2018: President Trump announces that he is withdrawing the United States from the JCPOA and signs a presidential memorandum to institute the "highest level" of economic sanctions on Iran. In a statement, Secretary of the Treasury Steve Mnuchin states that sanctions will be reimposed subject to certain 90 day and 180 day "wind-down periods." In an address following Trump's announcement Iranian President Rouhani announces that Iran will continue negotiations with the other states in the agreement in order to try to continue the deal without the United States. British Prime Minister May, German Chancellor Merkel and French President Macron re-state their continued commitment to the deal and pledge to work with all parties to make sure its terms are upheld. EU foreign policy chief Federica Mogherini states that the EU is committed to the JCPOA as long as Iran continues to implement its nuclear related commitments, as it has so far. And last but not least, the further development of a transparent, rules-based business environment in Iran." May 17, 2018: The European Commission meets in Sofia and announces that it will pursue a "blocking statute" to ban European companies and courts from complying with U.S. sanctions against Iran. May 21, 2018: Secretary of State Mike Pompeo presents the Trump administration's new strategy on Iran after the U.S. violation of the JCPOA in a speech at the Heritage Foundation, promising to "apply unprecedented financial pressure on the Iranian regime" and work with allies to deter Iranian aggression. If the United States were to pursue a new deal, Pompeo lists 12 demands for Iran, including stopping enrichment, ending the proliferation of ballistic missiles and the development of nuclear-capable missile systems and allowing the International Atomic Energy Agency to have "unqualified access to all sites throughout the entire country." In exchange, the United States would be prepared to end "the principal components of every one of our sanctions against the regime," as well as re-establish full diplomatic and commercial relationships and allow Iran to have "advanced technology." June 6, 2018: Iran opens a new facility for centrifuge production, an act which does not violate the JCPOA. Reza Najafi, Iran’s ambassador to the IAEA, tells press June 6 that the decision to open the facility is the “preparatory works for a possible scenario” if the JCPOA fails and reiterated that Iran will not start “any activities contrary to the JCPOA” at this time. The European Commission adopts an update of the Blocking Statute to include extraterritorial sanctions that the United States re-imposed on Iran and an update of the European Investment Bank (EIB)'s External Lending Mandate to make Iran eligible for investment activities by the EIB. "These measures are meant to help protecting the interests of EU companies investing in Iran and to demonstrate the EU's commitment to the Joint Comprehensive Plan of Action (JCPOA)," reads a European Commission press release. July 6, 2018: The JCPOA Joint Commission meets in Vienna and releases a statement on "the way forward to ensure the continued implementation of the JCPOA in all its aspects following the withdrawal of the United States from the deal." July 16, 2018: EU foreign policy chief Federica Mogherini confirms at a press conference that the United States refused a request by France, Germany, the UK and the EU to exempt entities doing legitimate business with Iran from U.S. sanctions penalties. July 18, 2018: Iran's head of the Atomic Energy Organization, Ali Akbar Salehi, announces that Iran built a new factory to produce rotors for up to 60 IR-6 centrifuges a day. Salehi says building the facility does not violate the JCPOA. July 26, 2018: Ten Republican Senators write a letter to the French, German, and British ambassadors to the United States urging compliance with the sanctions reimposed by Trump and warning against efforts to block or circumvent the measures. The letter says it would be "particularly troubling if you sought to evade or undermine American statutes" and doing so "could well prompt Congressional action." August 6, 2018: In a joint statement the EU, French, German, and British foreign ministers say they "deeply regret the re-imposition of sanctions by the US" and note that they are "determined to protect European economic operators engaged in legitimate business with Iran, in accordance with EU law and with UN Security Council resolution 2231." They reiterate that preserving the JCPOA is a "matter of respecting international agreements and a matter of international security." August 7, 2018: Certain sanctions measures reimposed by Trump May 8 come into full effect. The measures include restricting Iran's purchase of U.S. dollars, trade in gold, precious metals, aluminum, steel, coal, software, and transactions related to sovereign debt and the automotive sector. Licenses allowing certain foodstuffs to be exported to the United States and Iran to purchase commercial aircraft are also revoked. August 16, 2018: Secretary of State Pompeo announces the creation of the Iran Action Group, responsible for "directing, reviewing, and coordinating all aspects" of the State Department's Iran strategy and led by Brian Hook with the title Special Representative for Iran. August 22, 2018: Iran says that the UK will help with the re-design of the Arak heavy water nuclear reactor to limit the amount of plutonium byproduct it produces, a task the United States had committed to under the JCPOA. Sen. Cruz (R-Texas), along with 15 republican senators, sends a letter to Treasury Secretary Mnuchin urging him to take all necessary steps to ensure the Society for Worldwide Interbank Financial Telecommunication (SWIFT) disconnects the Central Bank of Iran and all other designated Iranian financial institutions. August 23, 2018: The European Commission adopts an €18 million package for Iran, the first part of a larger €50 million package, including €8 million assistance to the private sector. August 27-28: The International Court of Justice hears arguments from Iran and the United States on Tehran's allegation that the U.S. reimposition of sanctions violates the 1955 U.S.-Iranian Treaty of Amity and Economic Relations. The United States contends that the court does not have jurisdiction to hear the case. September 12, 2018: The International Atomic Energy Agency (IAEA) reports that Iran is implementing all nuclear-related commitments under the JCPOA in a quarterly report. Iran’s stockpile of uranium enriched to 3.67 percent uranium-235 is 139.4 kg, below the 300 kg of UF6 limit set by the accord, according to the report. Iran's stock of heavy water is 122.9 metric tons, below the 130 metric ton limit. September 24, 2018: The foreign ministers of China, France, Germany, Russia, the United Kingdom and EU foreign policy chief Federica Mogherini meet in New York to discuss the implementation of the JCPOA. The participants decide to establish a Special Purpose Vehicle "to facilitate payments related to Iran's export (including oil) and imports, which will assist and reassure economic operators pursuing legitimate business with Iran." September 25, 2018: U.S. President Donald Trump speaks at the UN General Assembly in New York. "Iran’s leaders sow chaos, death, and destruction," he says, adding that many countries in the Middle East supported his decision to withdraw from the JCPOA and reimpose nuclear-related sanctions on Iran. "Additional sanctions will resume November 5th, and more will follow. And we’re working with countries that import Iranian crude oil to cut their purchases substantially.... We ask all nations to isolate Iran’s regime as long as its aggression continues. And we ask all nations to support Iran’s people as they struggle to reclaim their religious and righteous destiny." On the sidelines of the UN General Assembly, U.S. Secretary of State Mike Pompeo, U.S. National Security Advisor John Bolton, U.S. Speical Representative for Iran Brian Hook, and representatives from Saudi Arabia, Yemen, Bahrain, UAE and Israel attend the United Against Nuclear Iran summit. Pompeo unveiled a new report by the State Department's Iran Action Group which chronicles "Iran's destructive activities." In his remarks, Bolton warns "there will be hell to pay" if Iran doesn't change its behavior. September 26, 2018: U.S. President Donald Trump chairs a summit-level UN Security Council meeting, officially about WMD non-proliferation, but which he tweeted would be about Iran. While Trump criticizes the JCPOA in the meeting, nearly every other leader in the council expresses support for the accord and encourages Iran to continue to comply. September 27, 2018: In his address to the UN General Assembly, Israeli Prime Minister Benjamin Netanyahu reveals what he describes as a secret nuclear warehouse “storing massive amounts of equipment and material from Iran’s secret nuclear weapons program.” Netanyahu also called on the International Atomic Energy Agency (IAEA) Director General Yukiya Amano to “do the right thing” and inspect the warehouse “immediately” before Iran finished clearing it out. He charged that Iran removed 15 kilograms of radioactive material from the warehouse in August, but did not specify if the material was uranium, plutonium, or another radioactive source. One intelligence official quoted in Reuters says that the facility has been known to the U.S. intelligence community for some time and it is full of documents, not nuclear equipment. The official says that “so far as anyone knows, there is nothing in it that would allow Iran to break out” of the nuclear deal any faster. October 3, 2018: The International Court of Justice (ICJ) rules unanimously that the United States “must remove, by means of its choosing, any impediments” to the export of food, agricultural products, medicine, aircraft parts, and other humanitarian goods. The 15-member panel concludes that Trump’s decision to reimpose sanctions on Iran was unfounded given Tehran’s compliance with the JCPOA, but the court did not order the United States to remove all sanctions or compensate Iran for damages. November 5, 2018: The second round of sanctions on Iran following Trump's withdrawal from the JCPOA, targeting Iran's banking, oil, shipping and ship-building sectors, come back into effect. In addition to redesignating entities removed from the SDN list under the JCPOA, United States designates an additional 300 new entities. The administration grants temporary waivers to China, India, Italy, Greece, Japan, South Korea, Taiwan and Turkey to continue importing Iranian oil at reduced levels, as well as waivers to allow nonproliferation projects at Arak, Bushehr and Fordow to continue. November 22, 2018: The International Atomic Energy Agency reports that Iran is implementing its nuclear-related committments. The IAEA's quarterly report finds that Iran's stockpile of heavy water is 122.8 metric tons, below the 130-ton limit and that Iran's stockpile of uranium enriched to 3.67 percent uranium-235 is 149.4 kilograms, below the 300-kilogram limit. November 26-27, 2018: EU and Iranian officials meet in Brussels for the third High-Level Summit on International Nuclear Cooperation. The EU and Iran review past nuclear cooperation projects and discuss ongoing modifications of the Arak reactor and conversion of the Fordow facility to a research site. December 12, 2018: The UN Security Council meets to discuss the biannual UN Secretary-General report on the implementation of UN Security Council Resolution 2231. The report welcomes Iran's implementation of its nuclear-related commitments "in the face of considerable challenges" from the U.S. withdrawal of the JCPOA. The report also notes Iranian activities that might violate the ballistic transfer provision in the resolution. At the meeting, U.S. Secretary of State Mike Pompeo announces that the United States will work with other UN Security Council members to reimpose on Iran the ballistic missile restrictions outlined in UN Security Council Resolution 1929. January 15, 2019: Iran attempts to launch a satellite using its Simorgh launch vehicle, but the satellite fails to enter orbit. U.S. Secretary of State Mike Pompeo characterizes the launch as “continued defiance of the international community and UN Security Council Resolution 2231," although the launch does not violate the resolution. January 29, 2019: The annual Worldwide Threat Assessment of the U.S. Intelligence Community assesses that "Iran is not currently undertaking the key nuclear weapons-development activities we judge necessary to produce a nuclear device." It adds that "Iran’s continued implementation of the JCPOA has extended the amount of time Iran would need to produce enough fissile material for a nuclear weapon from a few months to about one year." January 30, 2019: IAEA Director-General Yukiya Amano reiterates that Iran is implementing its nuclear-related obligations under the JCPOA and states that attempts to "micro-manage or put pressure on the agency in nuclear verification" are "counter-productive and extremely harmful" in remarks to the IAEA staff. Although Amano doesn't name who was putting pressure on the agency, he is likely referencing Israeli and U.S. efforts to persuade the IAEA to investigate what they deem a "secret atomic warehouse" in Iran, which Israeli Prime Minister Benjamin Netanyahu described in his September UN General Assembly speech. January 31, 2019: Germany, France and the United Kingdom establish a "special purpose vehicle" to facilitate transactions for non-sanctioned trade with Iran, called the "Instrument in Support of Trade Exchanges" (INSTEX). February 13-14, 2019: The United States and Poland host a ministerial summit on the Middle East in Warsaw where U.S. Vice President Mike Pence explicitly calls on “our European partners to withdraw from the Iran nuclear deal.” Several European foreign ministers boycott the summit. March 6, 2019: The International Atomic Energy Agency reports that Iran is implementing its nuclear-related commitments. The IAEA's quarterly report finds that Iran's stockpile of heavy water is 124.8 metric tons, below the 130-ton limit and that Iran's stockpile of uranium enriched to 3.67 percent uranium-235 is 163.8 kilograms, below the 300-kilogram limit. The JCPOA Joint Commission also meets in Vienna March 6 and all parties reiterate their commitment to the full implementation of the JCPOA. March 19, 2019: Iran announces that it registered its counterpart to the Instrument in Support of Trade Exchanges (INSTEX). March 22, 2019: The U.S. Treasury Department designates 31 Iranian entities and individuals for past involvement in Iran’s nuclear weapons program under an executive order targeting the proliferators of weapons of mass destruction. April 8, 2019: The United States designates the Islamic Revolutionary Guard Corps as a Foreign Terrorist Organization. April 9, 2019: Iranian President Hassan Rouhani announces that Iran will install a cascade of 20 IR-6 centrifuges at Natanz. April 22, 2019: U.S. Secretary of State Mike Pompeo announces that the United States will not issue any additional sanctions waivers for states to continue importing Iranian oil on May 2.